Here is the list of Best Free School Management Software for Windows. These software let you take care of various aspect of school management. You will find options to add Students info, Staff info, Classes, Courses, Calendar, Events, and much more. Student progress can be tracked by regularly updating results, remarks, and activities. These free school management software also provide options to track staff as well as student attendance. Some of these software also have provisions for teacher, student, and parents login. This provides easy tracking of progress, updates, notices, results, and attendance. These also let you generate custom reports for students, staff, parents, courses, classes, and much more. Go through this list of best free school management software to know more about them. You will also know how to install these software and get started with them. Out of the 4 school management software mentioned here, 3 of them are PHP web based applications. To run these applications, you will require a PHP server. On the PHP server, you will have to host the PHP files of these applications, then only you will be able to access these school management tools locally or globally. After that, you can access these tools from anywhere online using their URL. One of these school management software is SQL based, and I will explain later how to get it up and running. I would recommend OpenSIS if you are looking for an advanced school management software. It has all the features required to track student activity as well as interact with students’ parents. Jasper School Management System could be your pick in case you are looking for a simpler school management tool. You can also checkout the list of best free Interior Design Software, Panorama Software, and History Cleaner Software For Windows. OpenSIS is a free and opensource school management software for Windows, Linux, and MAC. 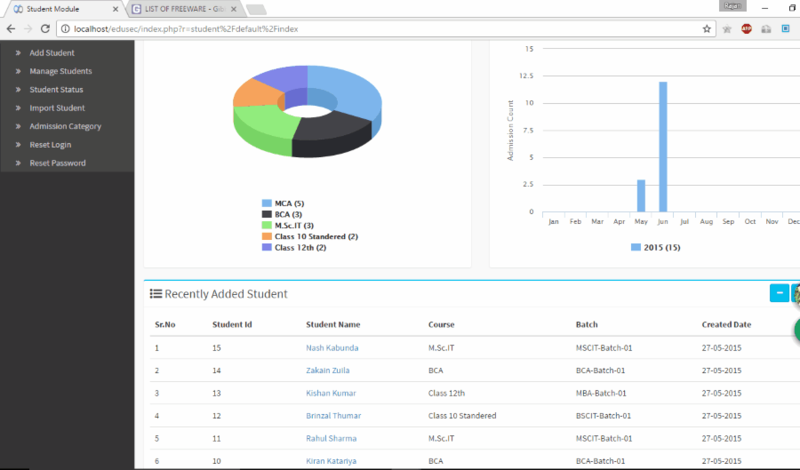 It lets you keep record of Students, Classes, School calendar, Teachers, Periods, Students’ grades, Students’ attendance, and much more. After you have installed OpenSIS, it first asks you to create a school calendar. Here you can define the working days, holidays, events, etc. for a calendar year. This option is available under School Setup, where you can also make periods, assign periods to different classes for different time, define Grade levels, Classrooms, add school information, add new school, manage courses, assign teachers, etc. Students can be added with various info, such as name, photograph, DOB, language, email, enrollment info, address, medical info, comments, goals, etc. Along with student info, you can also create student login ID for them to check their reports, progress, classes, events, etc. The Users tab is an important one, as it lets you carry out various user, staff, and parents based operations. Add a staff, add parents, add administrative users, add students’ grades, add progress report, take attendance, and manage extracurricular activities. The Scheduling option lets you view students’ schedule, add schedule, manage student requests, group scheduling, and generate various reports for schedules, class lists, student requests, etc. To track and generate student progress report in this free school management software, the Grades tab can be used. It lets you generate calendar wise and semester wise progress report. You can also generate Grade breakdown report, Student final grade report, GPA report, Honor roll, etc. You can also track student attendance, add attendance, add absence, and generate attendance based reports. The Extracurricular option lets you add various extracurricular activities and enroll students to the activities. OpenSIS lets you interact with other users, students, and parents by sending them messages. An option to generate Log report for a given date is also available. It is a feature rich school management software which lets you thoroughly take care of student activity, grades, curriculum, attendance, progress, and much more. eduTrac Student Information System is another free and opensource school management software. Just like OpenSIS, you can manage and take care of various aspects with this free school manager software. The options available let you manage Courses, Students, Employees, Fees, and get various types of reports that can help with complete analysis. 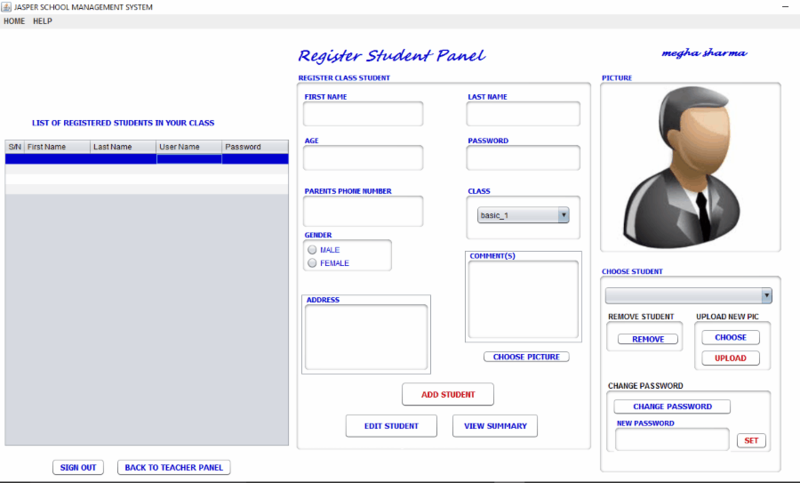 The interface of this free school management software is pretty easy to work with. The layout has a panel on the left side of the interface with all the menu options. Configuration: Here, you can add various entries under different subcategories. You have to add names of Country, State/Province, City/Town, Institute, Languages, Holidays, Document types, etc. that you may have to use while working and making various entries with this software. Dashboard: The Dashboard provides you options to post messages, notices, and schedule events on calendar. For an event, you will have to define event start time, event end time, event type, and event details. Course Management: Create and manage all the courses that your institution has to offer. For a course, you can add name, code, alias, start date, end date, and set if the course is active or inactive. You can also create different batches for a course and manage them from here. Student: This module has options to add students, manage students info, view student statistics, create admission category, and reset student login. For each student, you can generate student ID, enter general info, define course, batch, and add student status. You can search for student based on different info added to their profile. 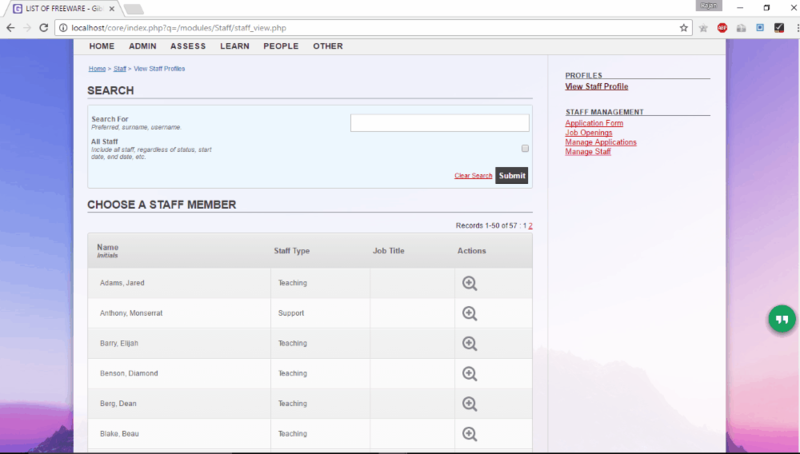 Employee: Add staff members here, create their login ID, manage employees, define their departments, designation, category, etc. Fees: Fees module lets you manage, collect, and, record the fees deposited by students. You can define the fee for different courses and even record which bank the fee is to be deposited. Report: The report dashboard is an important module. You can view custom reports for employee activity, student activity, and login history. User Rights: Admin can provide or limit user rights for various categories of users from here. This free school management software lacks few features, such as: no feature to store parent info, no login access to parents, and no option to upload student/employee info. But, I still found it to be a pretty good school manager software because of its ease of use. Gibbon is a powerful and advanced school management tool which provides various modules to manage various aspects of a school. Apart from registering student info, teacher info, attendance, and scores, this software has much more to offer. 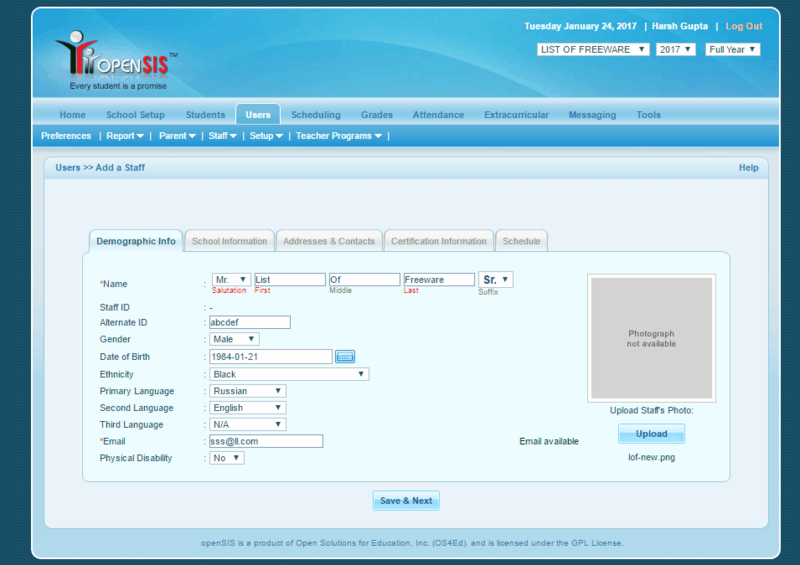 Login options for Teachers as well as Students are available to access resources, assessments, planner, timetable, etc. Gibbon provides a number of modules which can be used and accessed according to the privileges provided to users by the administrators. Timetables for students and teachers can be displayed based upon the period timing, class, and name. This helps to find in which room they are. Create activities and let students and parents sign up for it online. A module to manage individual educational needs of students is available. The Library Manager tool is very helpful and lets you manage the belongings of library by keeping track of inventory, dues, and library users. Marks can be updated regularly and the tracking graph lets you view and analyze student development overtime. Mark attendance for students and also view attendance pattern of students quickly. Manage staff, their payrolls, HR activities, feedback, and much more. Upload resources for students to learn from. A messenger tool lets staff and students keep in contact and convey messages personally or to a group. There are a number of various other features that you will love about this free school management software. Jasper School Management System is a Java based school management software. It is a pretty simple software to use, and lets you easily maintain student, teacher, class, and other school related data. Installing and getting started with this software is a bit different from above three mentioned software. It requires a database software to be installed on the server, such as: MySQL (free database software). After installing MySQL, create a database user with any name and make it password protected, and then under that user, create a new database with the name Jasper (This school management software only runs when it is connected to a database named Jasper). Now under Jasper database, you will have to import the jasper.sql file, which is provided with the installation file of this school manager software. Once you have loaded the sql file in Jasper database, begin with the installation on local computers. After installing this software, you will be asked to configure it with the database you created on the server. You will be asked to enter the IP address of the server, database username and password, and port number of SQL. That’s it with the configuration part. Now, you have to setup the school name and the number of classes. Now the software is ready to use. For the first time, you will have to login with default username and password, that are admin and admin, respectively. Now the software will ask you to enter details of head administrator. Enter name and other details, along with a photo. When you have created the head admin profile, you will have to login again with the head administrator’s ID. Now you can begin with adding Teachers and assigning rights to teachers. The head administrator has the rights to review teacher’s data, students’ data, class data, and issue notices. The assigned teachers can perform various tasks to manage students and their performance using this free school management software. A teacher has rights to add students, add subjects, set questions, collate report card, track student’s performance, manage attendance, upload scores, view report card, etc. A teacher can create student login ID for students to login to this software and take assessment tests. There are no options for students to access apart from taking exams.